Beverley De-Gale and her "soulmate", Orin Lewis are courageous and tenacious parents. Not only have they supported Daniel through his six tortuous years of leukaemia treatment and relapses - and the recovery from his bone marrow transplant - but they have also set up their own charity to increase the numbers of prospective donors from the black community. Daniel was six years old when he was first diagnosed with ALL (Acute Lymphoblastic Leukaemia). A week later his mother was told, and he would have died. Today Daniel is looking forward to his 17th birthday celebrations, is happily studying for his ’A’ levels, and aiming for a high-profile job as a sports presenter. Beverley (who tells their story here) and Orin believe that the struggle to save their son’s life was for a greater purpose. Daniel was a typical happy-go-lucky boy up to the age of six, but then he developed flu-like symptoms, which he couldn’t shake off. I took him to the doctor three times, twice they said it was flu and once stress and just prescribed Calpol. But Daniel continued to complain of aches and pains in his legs, raised glands and bruising on his body. He wasn’t eating and was constantly tired. Finally on April 7 1993 I took him back to the doctor and insisted he carry out further tests. Later that night a female doctor from the practice came to our house, almost in tears, to tell me that Daniel had leukaemia and would have to go straight to Mayday Hospital to start a course of antibiotics. I stood there in shock, and then cried. At the hospital I was told that if I had waited another week he probably would have died, because the leukaemia cells had severely infiltrated his blood system. We were rushed by ambulance to Great Ormond Street Hospital (GOSH) where he bad a bone marrow check to determine which type of leukaemia he had. 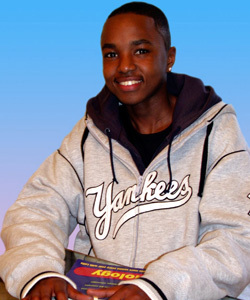 Daniel was suffering from ALL (Acute Lymphoblastic Leukaemia). We were all in a state of complete shock and disbelief and very fearful of the next stage. I assumed that I was probably going to lose Daniel, but was told that about 80 per cent of children are completely cured after two years of treatment. Daniel was immediately put on a two-year course of chemotherapy, which he completed in March 1995. He coped well and was still able to go to school. After two years we were told by the hospital to ’go home and enjoy life. We had a homecare team who gave Daniel monthly blood tests, but everything seemed fine until we got the call, in December 1995, to say that Daniel had relapsed. Naturally Daniel was devastated. Straight after Christmas we were back at GOSH where consultants Paul Veys and Ian Hann, explained the possible options. The first was a further two-year course of intensive chemotherapy treatment called ’relapse I ALL’, a different timetable of drugs but with much more toxicity. Because the first course had not killed the disease, it was generally thought that a bone marrow transplant would ultimately be the best option. But the doctors felt confident that a second course of chemotherapy could still be successful, and that it would be better for Daniel. A transplant is seen as a last resort. If we did have to consider a transplant though, a match would have to be found. Daniel’s sister Dominique, aged six at the time, was tested. She had a one in four chance of being a successful match - unfortunately it was not to be. All family members and friends were tested, with no luck. Next would be a search through the black and mixed parentage potential donors on the worldwide registers. Dr Paul Veys told us that there were only 550 African, African Caribbean, and people of mixed parentage on the UK register. This made Daniel’s chances of finding a match within the UK as little as 1 in 250,000. Orin and I came to the conclusion that the numbers were so low because within the black community there was a total lack of awareness, combined with a fear of needles and concerns about giving blood. While Daniel’s second course of chemotherapy was going on, Orin and I decided to take the matter into our own hands. On June 2nd. 1996 we set up a charity called the African Caribbean Leukaemia Trust (ACLT). We wanted to raise awareness in the black community about leukaemia and bone marrow transplantation, to find new donors and to support and assist people suffering with leukaemia and any other blood-related illness. To begin with we hit a lot of brick walls. People just weren’t interested. But, when you’re trying to save your son’s life, "No" is not a good enough answer. We made it our mission to make people sit up and listen to Daniel’s plight. It was agreed that through continuous campaigning our chances of finding Daniel a match would be considerably increased. That was the start of a very long journey; sheer desperation and determination drove us forward. Orin and I started creating/raising awareness about Daniel through appeals in both local and national newspapers and on radio and TV stations. Soon a small group of family and friends joined us and we set up registration clinics in the predominately black areas throughout the UK. Slowly the numbers of black people on the register started to grow. Meanwhile Daniel continued with his treatment and seemed to be coping with the cocktail of chemotherapy being pumped into his body, although the drugs made him tired and be spent a lot of time out of school. He remained positive throughout this ordeal. The media campaign was at such a high profile that other sufferers’ families started asking us for help. It was explained clearly to everyone that the bone marrow tissue type details of each potential donor are logged onto the Anthony Nolan Trust’s database which is accessible to hospitals around the world looking for matches. This meant that the lifesaving work would potentially help all sufferers awaiting matches, not just Daniel. On October 18th 1996 the ACLT became a registered charity and in January 1998, Daniel successfully completed his second two-year course of treatment. He was now 11 years old, and full of confidence. Life was definitely on the up. Orin and I continued campaigning for other families, and also continued looking for a match for Daniel - just in case. The African, African Caribbean, and mixed parentage register had now grown to approx. 3,500, from just 550! In September 1998, Daniel started Archbishop Tenison secondary school. For him it was like starting a new life. He settled in like a duck to water, but six weeks later I received a devastating call from one of Daniel’s homecare nurses to say that a blood test he’d had the day before had shown possible leukaemia cells. How could it be possible and how would I break the news to Daniel? He had been so brave over the years, what more would he have to endure? And, worst of all, what did the future hold? The following Monday his GOSH consultants confirmed the terrible news and told us that Daniel’s only chance of survival was a bone marrow transplant.We all decided that he would be put on a timetable of chemotherapy and other treatments, and at the same time we would step up the campaign to find the elusive match. First we had to persuade Daniel to allow the campaigning on his behalf to begin again. He had been happy in his new school, where no one knew of his life-threatening situation, and be was convinced that his new friends would distance themselves if they found out the truth. Eventually he agreed that they would stick by him, and that any who didn’t weren’t true friends. He also realised that without publicity the chances of finding a match would dwindle drastically. The ACLT went into overdrive. Publicity was at its highest. The Duchess of York read about Daniel and contacted me at work one day from New York, asking if she could be of any assistancel She has helped immensely. We were desperate, and she opened the doors to the GMTVs of this world. John Fashanu (who last year donated the Â£215,000 his appearance on I’m a Celebrity - Get Me Out Of Here generated to ACLT) visited Daniel at GOSH to offer his support, whilst the actor Colin Salmon also offered his full support after meeting Orin and I at a fundraising event. As did Ian Wright and John Barnes. These five became ACLT patrons. Their aim was to help increase awareness about Daniel, and we had a massive response to the charity registration clinics that were held from October 1992 onwards. Everyone wanted to help this 11-old boy who had brought our community together with just one aim, to find a matching donor. Clinics were so successful that between 350 to 800 blood samples were being taken at any one clinic. Mothers and fathers even brought their small children to be tested. Unfortunately this could not be done because the age range for unrelated donors, in the UK, is 18 to 60 years. There was a real feelgood factor at the clinics, and we felt so proud of our community. The campaigning stretched as far as the Caribbean and the USA. The BBC programme Black Britain that had originally highlighted Daniel’s story was also screened in the Caribbean. By March 1999 the register had grown to about 12.000, but then we hit a major snag. Due to the ACLT’s rapid success it was becoming logistically impossible for the Anthony Nolan Trust to process enough blood samples within the UK. So they put us in touch with a laboratory in the US that would be able to tissue type on our behalf. The ACLT sent thousands of blood samples to be tested in the USA, at a cost of $45 (approx. Â£28) per sample. This caused a substantial financial headache. Orin and I realised that unless we could quickly raise funds, the registration clinics would have to cease - seriously reducing Daniel’s chances of finding a match. We undertook a massive campaign to raise the necessary funds. Daniel was back in remission by this time and the consultants said they would try to keep him on a maintenance form of chemotherapy. It was vital he remained in remission until a donor was found. Generous donations poured in from all over the UK and the ACLT was able to pay off the US blood-testing bill in August 1999. During April 1999 I was at home with Daniel, when a call came through from the bone marrow specialist Dr Paul Veys, at GOSH. A matching donor had finally been found! Further blood samples had already been carried out and it was looking good. If you had to mark it out of 10, it would be a 9 -an excellent match. The one marker that did not match would have caused problems, in the past, but technology had moved so far forward this was no longer a problem. I was in a state of disbelief and asked so many questions, ’Is this person aware that they are a match?’ ’Are they willing to come forward?’ ’When will it go ahead?’ I was very grateful but initially dubious because a previous match had dropped out. But the answer to all my questions was ’yes’, and the transplant was scheduled for May or June. When I put the phone down the realisation hit me with a thud. Daniel was standing in front of me asking what had happened. We had always been honest with him. His response to the news was not surprisingly very laid back. He had been told at earlier appointments that when a match was found be would have to have more chemotherapy, also radiotherapy (he’d never had this before), with at least eight weeks in complete isolation. He would spend about three months in hospital, followed by a very long recovery period. He was also painfully aware that the transplant was the last resort. We had many family discussions about the pros and cons of the transplant before Daniel accepted that it would be the long-term answer. Then be once again focused his mind on a positive conclusion. We only told a few people about the news of the hopeful match. On June 3 Daniel and I were admitted into GOSH Robin Ward (bone marrow transplant ward) to begin the long process. It was a very dark period for Daniel. He was in a lot of discomfort because be had to have extensive chemotherapy and radiotherapy. He had five days (twice a day) of total body radiotherapy, to completely wipe out his bone marrow. It was at this stage that Daniel and I went into complete isolation. He also spent a lot of time on his own because he wasn’t allowed to come into contact with anything that might cause infection. His blood cell counts dropped to zero. Finally our 12-year-old son got what he truly deserved when on June 16th the unknown donor’s bone marrow arrived at GOSH and was given to Daniel intravenously at 6:50pm. A transfusion bag no bigger than a 288ml carton of Ribena. That was it. It was what we had prayed for, and was going to give Daniel back his life. The transplant was filmed by Orin and passed on to Carlton TV’s London Tonight to be screened the next day to show viewers bow simple it really was. That night a feeling of immense relief saturated us, and Daniel and I slept well while Orin went home to start letting everyone know Daniels news. The next day GMTV, London Today and Choice FM all announced that the miracle had happened. Daniel and I woke up at 6am to watch the news as it was announced. The response was immense. Letters started pouring into the ward. In the weeks that followed Daniel had very low periods as the side effects started to take their toll. The doctors monitored his blood results every day to see when the donated bone marrow would start to produce white blood cells. It took about 15 days. This was the most difficult time throughout the six years of treatment for Daniel. He was very sore from mouth, throat and stomach ulcers. He couldn’t swallow anything and had no appetite, so the nurses fed him, via a tube in his nose that travelled down into his stomach. On July 30, and much sooner than anticipated, Daniel was released from hospital. He came home with a lot of medication and a long recovery period ahead of him, before returning to school in December 1999 in a blaze of publicity. ’It’s good to be back doing normal stuff again,’ he said at the time. It will be many years of being monitored and checked before we will truly know if the transplant is going to be a long-term success. But Daniel remains confident and confronts the physical and mental hurdles that he, and everyone in a similar position, has to face on the road to a hopefully full recovery. He has concentrated on living as normal a life as possible and sat his GCSEs exams last year. He passed all 12, with A* to C grades, and is now studying four ’A’ Levels. He did two weeks’ work experience at the BBC television studios, in the sports department, learning about all aspects of how TV programmes such as Grandstand and Match of the Day are put together. We are always hopeful that Daniel will do well. He seems to be heading in the right direction. We just want him to lead a healthy, long, safe, happy, fulfilling life. We will be eternally grateful to his mysterious donor. We have never met, but know now that she was a 45-year-old woman. We remain hopeful that we will meet her one day and Daniel is very excited at the thought of that momentous event. He was one of the first black people in the UK to receive a bone marrow transplant from an unrelated donor. Because of this, many sufferers and their families are now coming forward. All we ask is that individuals stay on their respective registers because, as Daniel’s situation has proved, anybody could be needed as a donor now or in months or years to come. In the past seven years we have increased the numbers of black people on the UK register from 550 to around 15,000. Hopefully anyone who has thought about joining will now be convinced. Orin and I have always known there had to be a method to the madness that Daniel had to live through, and we feel that from a negative situation a positive solution began. Now he has the chance to live a long and fruitful life, thanks to this wonderful person. Utilising our motto, ’By Any Means Necessary’, we will continue to educate people on just how important each 18 to 45-year-old black person in the UK is in relation to helping to save or change a sick person’s life. My brave and handsome son Daniel De-Gale - what an inspiration he is to us all!" Sadly, after a brave fight with an illness unrelated to his cancer, Daniel passed away on October 8th 2008. Our thoughts go out to his family. There are three donor registration clinics planned. To find out more about these or to help with fundraising call ACLT (African Caribbean Leukaemia Trust) on 020 8667 1122 or email: info@aclt.org. For more information about other aspects log onto the charity’s website www.aclt.org. If you are not of black or mixed parentage, and would like to become a donor, contact the Anthony Nolan Bone Marrow Trust on 0207 284 1234, Website: www.anthonynolan.org.uk.